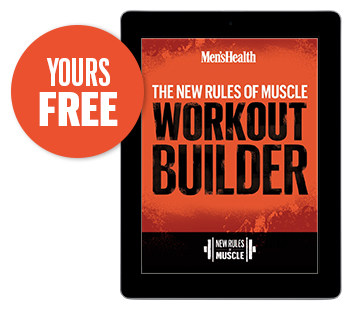 Get jacked with the NEW RULES OF MUSCLE from Men's Health fitness director Ebenezer Samuel. NEW RULES OF MUSCLE is Men's Health newest training program from fitness director Ebenezer Samuel. This 2 DVD set contains five intense 30-minute workouts that'll get you jacked in just 28 days. ✔ Add 1 Inch to your arms in 4 weeks with the TUT and constant tension techniques. ✔ Carve out your ultimate six-pack by using one devastating plank finisher. ✔ Blast through a 3-minute challenge to completely exhaust your legs. ✔ Master two pushup variations that will have your chest crying. ✔ Build a superhero back with 3 row variations. ✔ Learn the biceps finisher that will rock every part of your arm. Yes, these new techniques are challenging - but that's how you'll get explosive results. Put in the work, and NEW RULES OF MUSCLE will help you build the bigger, stronger body you've always wanted. All you need is an adjustable bench, a couple pair of dumbbells, and the courage to break some rules! CAN NEW RULES OF MUSCLE TRANSFORM YOUR BODY? I searched online, tried tons of programs, drank gallons of protein shakes, added more sets, more reps, and more weight. But I never saw muscle growth. These techniques shocked my system - unleashing muscle growth like I'd never seen before! And now I've teamed up with Men's Health to show you what I learned. IT'S TIME TO TRASH YOUR OLD GYM TECHNIQUES! NEW RULES OF MUSCLE features a mix of the most challenging and powerful methods to help you pack a ton of volume in less time. It will shock your muscles in completely new ways for explosive muscle growth. ∎ Bench Presses — and more! ✔ Learn how to schedule your weekly workouts with the 4-Week Startup Plan! ✔ Get cut for a special event or beach season with the 3-Week Shred! ✔ Chisel rock hard arms with the 3-Week Ultimate Arm Blast! ✔ Keep the impressive muscle you've built with the 4-Week Maintenance Plan! The link for your downloadable free gift will be on the back cover of your New Rules of Muscle DVD.